Carbon-look CNC-machined vibration damper in sporty look and prevent weaving at higher speeds. Available in various colours and 2 handlebar internal diameter sizes. 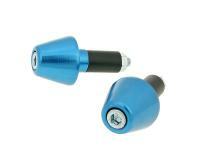 Aluminium core: 13.5mm and steel core 17.5mm. Please measure before ordering 1x pair in anodized blue for 13.5mm bars supplied.